Between The Gig Week Hong Kong last week and H2 Live Music Festival starting on Monday, there’s a sudden outpouring of love for local live music. And while the former is the new kid on the block, the Wanch’s H2 Festival (formally known as Handover Hallelujah) has been flying the flag for the city’s live music scene for eight years. From humble beginnings, H2 has grown into a seven-day, 70-plus band behemoth, taking in every genre of music you can conceivably think of. It’s ambitious and only exists because of the efforts of festival director, co-owner of the Wanch and member of The Sleeves (who play Thursday night – go see them) Keith Goodman, and the enthusiasm of the bands queuing up to play. No matter what day you go along to the Wanch, the atmosphere will be amazing and given the sheer number of bands playing, you’ll definitely hear something you like, no matter what you’re into. And how much for the pleasure of attending this tent-pole event in the live music calendar? Not a penny. Nothing. Nada. Completely free every single night. So, uh, The Tracy Lords? Hell's house band The Tracy Lords are a chaotic smash 'n' grab of primordial sludge in molten tones and car-wreck, whiplash rhythms. With enough artfulness, drama and sadness to keep the young'uns interested and lo-fi charms for the punk rock cognoscenti, The Tracy Lords' hope-crushing heaviness is inflicted with the simple MO of set up, break the audience into little pieces and get out. Well then. Hong Kong live music. Any thoughts? Hong Kong music is ghettoised so rock bands, folk acts, indie acts, etc, tend to only share bills with other musicians in their respective genres. A particularly inspiring night of H2 really can be like Hong Kong on shuffle. The Tracy Lords also take a perverse joy in upsetting dad-rockers. The Tracy Lords Rock ‘n’ roll, playing on Monday at 9.45pm (fb.com/TheTracyLords). I play bars (Saturday resident gig at Bandstage in Wong Tai Sin), back artists at concerts, and do weddings and functions. I'm also a Civil Celebrant of Marriages, although I am yet to be engaged to both perform and conduct the marriage ceremony at the same gig. David Ma & The Voodoo Makers Elvis meets the Rolling Stones, playing on Wednesday at 11.15pm. So what do you make of the H2 festival? H2 is a brilliant way for bands to meet up and share different audiences. You may go to see one band and find many more that you like. The mix of genres and styles really promotes the HK music scene as alive and well. The festival scene is growing in Hong Kong and it's a great way to network and keep the scene alive. The Sideburns Rockabilly, playing on Sunday at 8.45pm. People might come along to H2, see Wan Chai Warriors and think, “Gee whizz, that could be me!” What would you tell someone with a head full of dreams like that? Go down to The Wanch on a Monday night for the jam night. You can arrange for your band to perform a few songs or you can collaborate with other local musicians on the night. There are other venues around HK that offer something similar. So, get down to a jam night, meet like-minded people and form a band. Then, practice, practice, practice! But, remember that if you want to be a successful band you need to market yourselves. You could be the best guitarist in the world but if you are too lazy to market yourself then your talent will be wasted. Get out there and just do it! Ailee, tell us, what would you like to say to the people of Hong Kong? 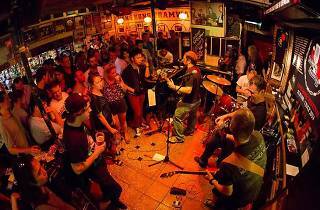 Step away from the Hong Kong bar scene and just enjoy some real freakin’ music. Ailee Slater Ukulele, opening the festival on Monday at 6.15pm. Your name is Glen. You've got one of the most unique/fun acts in town, how has it been for you and others to take your career to the next level? What can we expect from Last Orders at H2 Festival? We play a range of covers from the '60s to present day. Set list consists of songs which people know but which don't get covered by many other bands. The aim is for upbeat songs that the audience can dance to and big choruses they can sing along to. Last Orders Classic glam rock, playing on Saturday at 7pm. 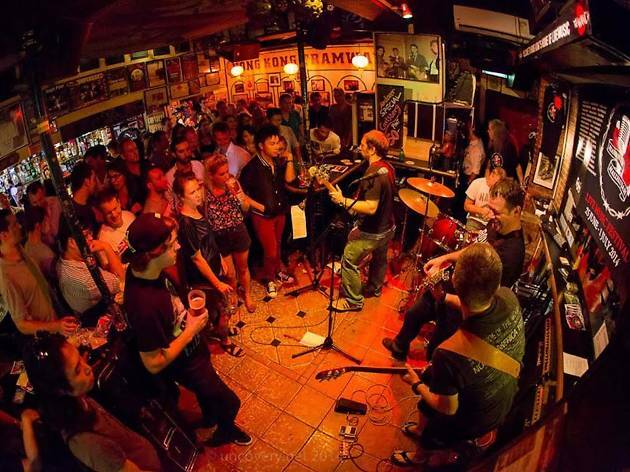 What do you think The Wanch represents and what does it mean to live music in Hong Kong? It's hard to score gigs around the city and festivals like these and live houses like The Wanch are extremely helpful for bands looking to play for an audience. Hong Kong needs a space for music. As you know, it's been a tough year for live music with the repeated Hidden Agenda fiasco for example, so places like The Wanch deserve recognition. Hey guys! Who're you looking forward to seeing? Roy Jet, the Sound Generation, Don’t Panic, Nana and The Octopus to begin with! The list is much longer! We need to know if we can dwell in The Wanch during the Festival days. Wanchai Road Rock, playing on Tuesday 6.45pm (fb.com/Wanchairoad). All of the ripper, fellow music-nerds who've supported The Wanch all these years and, of course, the bonza Budgies rent-a-crowd! The Budgie Smugglers All-Aussie band doing hilarious Australian stuff, playing Saturday at 8.30pm.